If you turned down the sound, you'd have no clue whether this was the Republican Convention or the Democratic Convention last week. Both looked just as boring at this point. Maybe the only clue would be that everyone in the audience looked old and white. 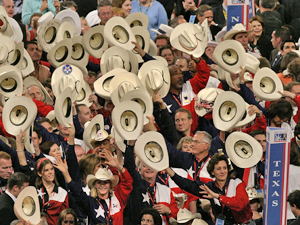 WAY more cowboy hats, too. Bush's speech: Do you notice how, when Democrats attack, they castigate the *administration* (Bush, Cheney, etc.) When Bush goes on the attack, he castigates 150 million Americans (i.e., the "angry left"). And people still don't know who's responsible for the "tone" in Washington? I'll be glad when these people are finally gone. This couldn't have helped McCain. Fred Thompson: red meat for the crowd, I suppose. Hard to watch this guy when he's not on Law and Order, when the writers give him lines with a bit more class. Thumb got tired hitting fast forward. Lieberman: finally, something that might help McCain. One good speech, McCain probably hoped this was the one the networks covered. He was smart enough to speak to actual potential voters. Again, notice how out of the mainstream the delegates here are compared to the audience at the Democratic convention: Lieberman has to excuse his appeal to reasonableness because it's basically an attack on the Rovian strategies McCain has used all summer. Yes, I noticed the empty seats, too. What do they think this is, the Beijing Olympics? End thought: Lieberman should just go ahead and marry McCain and get it over with. It's obvious they're in love.